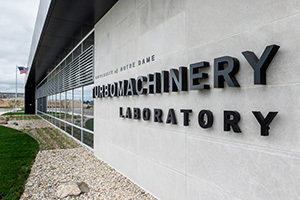 The Notre Dame Turbomachinery Laboratory (NDTL) at the University of Notre Dame has entered into a 19-month, $2.5-million dollar agreement with Doosan Heavy Industries & Construction Co. Ltd. (DHI) to conduct compressor research and testing to support the development of a 300-megawatt class power generation gas turbine. Testing will occur at NDTL’s 10MW compressor test cell, which is currently under construction with the goal of becoming fully operational this fall. Once the test cell is completed, NDTL will be home to one of the largest compressor research facilities at any university in the world. The agreement is a milestone for NDTL, which continues to expand its capabilities into the global commercial power industry. The compressor test will study aerodynamic phenomena that even the most powerful computers cannot simulate. All design, analysis, fabrication and assembly will take place at NDTL’s facility located at Ignition Park in South Bend, Ind. DHI, a major player in the power industry based in South Korea, specializes in power generation equipment and EPC (engineering, procurement and construction). “We’re excited to work with NDTL on this project and would like to establish a strong, long-term relationship with NDTL for upcoming gas turbine engine development programs,” said Joohwan Kwak, head of compressor development at DHI. NDTL is focused on research, testing and workforce development for a wide range of applications that involve turbomachinery technology. NDTL’s new 28,000-square-foot, world-class facility offers experimental and numerical capabilities for the development of rotating machinery that requires high power levels and related specialized support. These capabilities create a shorter development path for new gas turbine engine technologies within any industry. NDTL is currently involved in research and product development for a variety of sponsors and collaborators including Pratt & Whitney, General Electric and Honeywell. For more information, visit turbo.nd.edu. Originally published by Jasmin Avila at news.nd.edu on January 23, 2017.